Mermaid II is a part of Mermaid Fleet. This modern boat offers to explore treasures of Indonesia. Mermaid II can welcome 16 divers on board. There are eight deluxe cabins, that supplied with air conditioner and private facilities. Also, they have panoramic windows with a gorgeous view of Indonesian blue water. 2 budget rooms are convenient too, has the same facilities as deluxe, but slightly smaller. Time in between and after dives boat's passengers can spend in the salon. It is comfortable for chatting with other passengers, here you can enjoy the movie or use boats library that has a full range of marine life books. Also, Mermaid II has open-air areas. It is perfect to relax in the sun, watch the sunset or read a book on one of the sun loungers. Large dive deck of Mermaid II is convenient, equipped with fresh water shower and numerous of storage boxes for the gear. Plus, it has a special area for photographers, a big camera table and a separate tank for rinsing photo equipment after the dive. Mermaid II can supply divers with EANx certification with Nitrox. Mermaid II equipped with necessary safety equipment, first aid kit, life vests, emergency rafts. Crew team is trained to manage emergency situations. 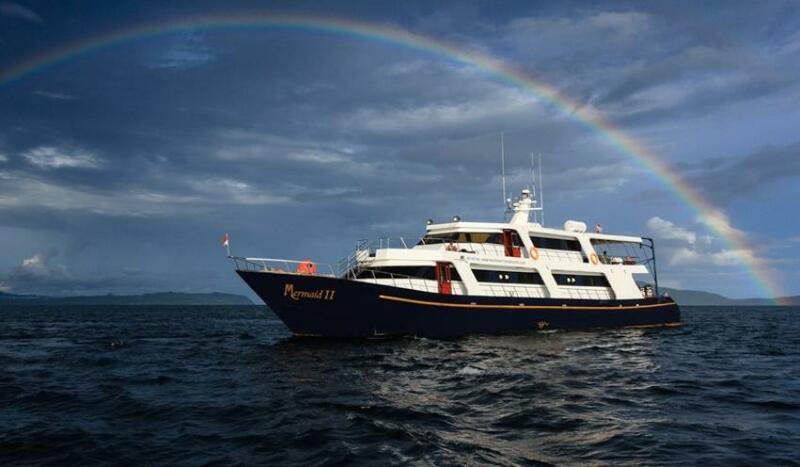 Mermaid II offers to visit Raja Ampat, Banda Sea, and Komodo Island. These itineraries are the top routes for diving in Indonesia. The variety of fish and corals in Raja Ampat, can’t leave anyone indifferent. Sharks and such an extraordinary creatures as wobbegongs can be seen while diving here as well. It is also known for high chances of meeting big mantas. Komodo National Park is, first of all, an amazing variety of underwater landscapes. Explore coral walls and pinnacles, mounts and reefs. Also, this natural reserve is a true paradise for macro diving. Nudibranchs and blue-ringed octopus can be seen here. The Banda Sea is a well-known destination of Indonesia for a chance to meet big pelagic fish. Komodo National Park is best to see between April and August. Although diving is good here all year round. As for Raja Ampat, diving conditions are the best from October till the end of April. It has been by far one of the best liveaboard trip I've been on. The crew were all very attentive and the guides were knowledgeable to ensure your experience satisfaction and safety! Overall, very professional and organised without forgetting the element of fun in each itinerary item :) Kudos to the Mermaid II team!